Alumni remembered RIT student Nicholas Murray by participating in the third annual Rhino Run on Oct 12. Proceeds will benefit a student from the Albany area who will attend the Kate Gleason College of Engineering. On Sept. 21, alumni took the “Ride-It” Segway tour through the city while learning about local history. Thanks to host Virgil McCullough ’78. 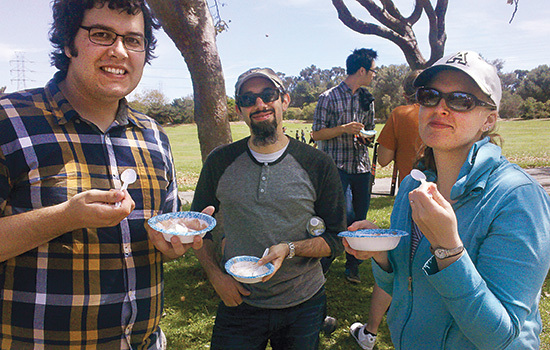 On Aug. 24, alumni gathered in San Mateo at Coyote Point Recreation area for the first ever RIT alumni taste of Rochester picnic. The picnic included Rochester food, such as Zweigle’s hot dogs, Grandma Brown’s baked beans and Abbott’s frozen custard. Special thanks to host Martin Hendess ’94. On Aug. 10, alumni gathered at the Buffalo and Erie County Naval & Military Park for a special guided tour. They toured the USS Little Rock, USS Croaker and USS The Sullivans, while learning about the history of these ships. On Aug. 10, alumni got together for the annual alumni chapter event at the Cleveland Indians baseball game. They caught up prior to the game at the picnic and stayed late for the fireworks display. Special thanks to Al Tuefen ’73 for hosting the event. On Oct. 12, alumni gathered for a homecoming event of their own. They met at Main Event Entertainment for an evening of bowling and friendly competition. Special thanks to host Scott Saldinger ’89, ’91. On Oct. 19, RIT and Clarkson held a joint alumni event at Ralphie’s to watch the RIT vs. Clarkson hockey game. Thanks to host Luke Netto ’12. On Sept. 21, alumni gathered for a volunteer day with the Greening of Detroit organization. Alumni assisted with tree and shrub planting in parks and along the streets of Detroit. Special thanks to host Yolanda Lewczuk ’00. Alumni in the Middle East were invited to the first annual Evening at the Oasis alumni reception with RIT Dubai President Yousef Al-Assaf on Oct. 3. On Sept. 8, alumni gathered at Ninfa’s for a reception before a Houston Dynamo Major League Soccer game. Thanks to host Mark Biscone ’99. Alumni in Delhi assisted RIT at the IIE/USIEF education fair and gathered for dinner at Baluci Restaurant at the Lalit Hotel on Sept. 6. Thanks to host Shipra Chaturvedi ’03. 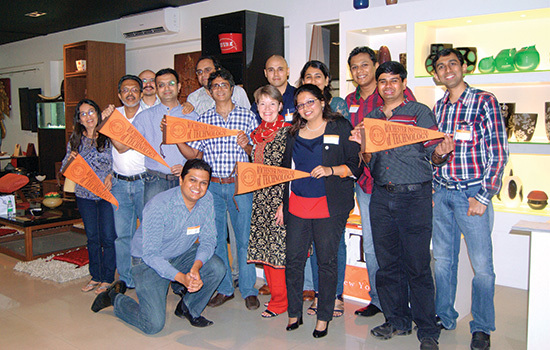 On Sept. 15, alumni in Mumbai assisted RIT at the IIE/USIEF education fair and gathered for a reception at alumni-owned design studio Confluence Elite Designs. Thanks to alumni host and owner Manasi Manjrekar ’10 and Ashutosh Agarwal ’01. Alumni also gathered for dinner in Chennai, Kolkata and Hyderabad in September. Alumni gathered for brunch at 5.Kat Restaurant on Oct. 6. Special thanks to Merve Evran ’06 for hosting and planning the event. Fifty-four alumni enjoyed a dinner Sept. 26 at the Royale Bintang hotel and heard updates about the university from Sonja Phongsavanh, associate director of Part-time and Graduate Enrollment Services. Nurul Hawa ’10 organized the event. On Oct. 26, alumni from the newly revived New Jersey chapter participated in Make-A-Difference Day and gave their time by helping the community clean up and rebuild in areas still in need after Superstorm Sandy. 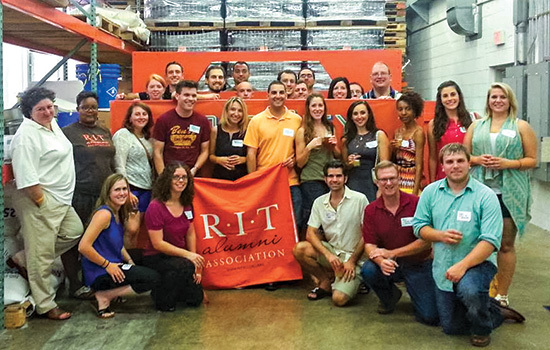 Special thanks to Marisa Santiago ’04 for coordinating the RIT group. On Aug. 8, African-American alumni in the NYC area gathered at Inc. Lounge for a networking happy hour. On Sept. 9, alumni watched Rafael Nadal win the 2013 U.S. Open men’s match against Novak Djokovic. Thank you Mike Larson ’93 for hosting. On Sept. 17, alumni gathered to cheer on the New York Mets against the San Francisco Giants. On Sept. 21, Jim Ferris ’81 invited the chapter to Doherty’s Irish Pub & Restaurant to come watch the Jim Ferris Trio perform. Alumni had an opportunity to meet and talk with Ferris before he performed. Thank you to chapter leaders Mike Pail ’98 and Sue Pail ’98 for hosting the evening. 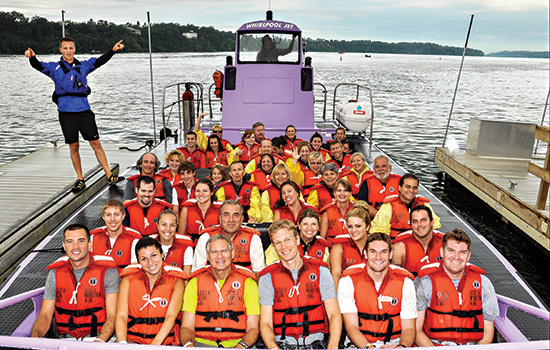 RIT alumni from Rochester and Buffalo got wet and wild on the Niagara River Jet Boat on July 20. The group enjoyed lunch at the famous Silo Restaurant in Lewiston after the ride. Thanks to alumni hosts Donna and Tony Kocienski ’78, Frank Lucas ’75 and Stacy Kurtz ’05. On Aug. 21, more than 100 alumni with children or grandchildren in RIT’s incoming freshman class gathered for the annual Alumni Legacy Dinner on campus. 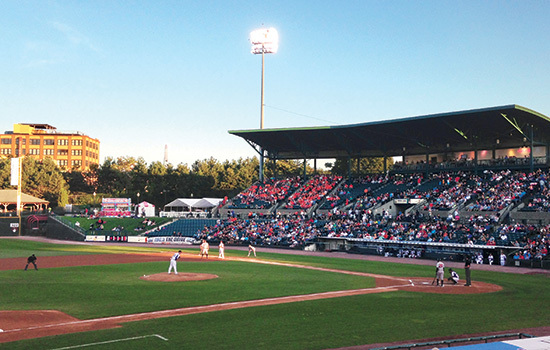 On Aug. 24, more than 400 alumni and guests attended RIT Day with the Rochester Red Wings. Alumni cheered on the Red Wings as well as the RIT men’s and women’s hockey team captains as they threw out the first pitch. Attendees also got a special sneak peek of the Frozen Frontier hockey game on Dec. 14. On Sept. 14, more than 20 alumni and students gathered for a day of service. They cleaned up and landscaped Mt. Hope Cemetery. Attendees enjoyed lunch at The Distillery afterward. Thanks to event hosts Bob Snyder ’56 and Maggie Reilly ’04. On Sept. 17, alumni took part in a career fair panel discussion, A Talk with Alumni. On Sept. 18, Native American alumni gathered at the Elmwood Inn to network with Jason Younker, associate professor of anthropology and assistant to the Provost for Native American Affairs; Nizhoni Chow-Garcia, research associate, and Jeffrey Burnette, associate director of RIT Future Stewards program. On Sept. 28, alumni attended a special reception at the First Niagara Rochester Fringe Festival Spiegeltent. Attendees were treated to performances by RIT’s Vocal Accents a capella group and Culture Clash featuring RIT professor and music department director Carl Atkins. Alumnae attended YWCA’s Empowering Women Luncheon on Oct. 8. AALANA (African American, Latino/a American and Native American) alumni took part in a full schedule of activities at Brick City Homecoming & Family Weekend, including a Happy Hour Kick-Off at Lovin’ Cup, a talk by Daymond John, a PlayDate Party and Bon Voyage BBQ with Howard Ward. Alumni gathered for a special Oktoberfest celebration at Lovin’ Cup on Oct. 23. Special thanks to alumni hosts Stacy Kurtz ’05 and Shirley Murphy ’81. On Aug. 8, alumni gathered for happy hour at the Tap House in Bellevue, Wash.
Syracuse area alumni met in Skaneateles on July 20 for a luncheon boat cruise on the lake. Alumni from the central Florida region gathered to cheer on the Tampa Bay Rays as they faced the New York Yankees on Aug. 24. On Sept. 28, alumni boarded the W.W. Durant to sail along Raquette Lake, taking in the beautiful fall foliage and historic scenery along the way. On Aug. 10, alumni toured Port City Brewery in Alexandria and enjoyed a flight of Port City beer at the conclusion of the tour. Afterward, the group continued down the road to Café Pizzaiolo for appetizers and additional networking. Special thanks to chapter leaders Carlo Costino ’04, ’07 and Phil Jones ’02 for hosting the event and Larry Ponzi ’92, who is the owner of Café Pizzaiolo. On Aug. 31, the cross country team held its annual alumni reunion and 5K Race. On Aug. 30-31, men’s soccer held its annual alumni reunion, which included the Doug May Memorial Golf Tournament and alumni soccer game. On Sept. 13-14, the baseball team held its annual reunion and alumni game. During Brick City Homecoming & Family Weekend, the following fraternities and sororities held alumni activities: Alpha Xi Delta, Delta Phi Epsilon, Kappa Delta Rho, Phi Kappa Psi, Pi Kappa Phi, Sigma Alpha Mu, Sigma Sigma Sigma, Tau Kappa Epsilon and Zeta Tau Alpha. The following programs and student organizations held reunions or anniversary activities during Brick City Homecoming & Family Weekend: NTID 45th anniversary, RIT Ambulance (RITA/EMU/SSU) 45th anniversary, electrical engineering 50th reunion, mechanical engineering 50th reunion and RIT Players.